The so-called "leadership of the revolutionary youth" of the Egyptian Muslim Brotherhood has threatened foreigners with physical violence, demanding that they leave Egypt by February 11. 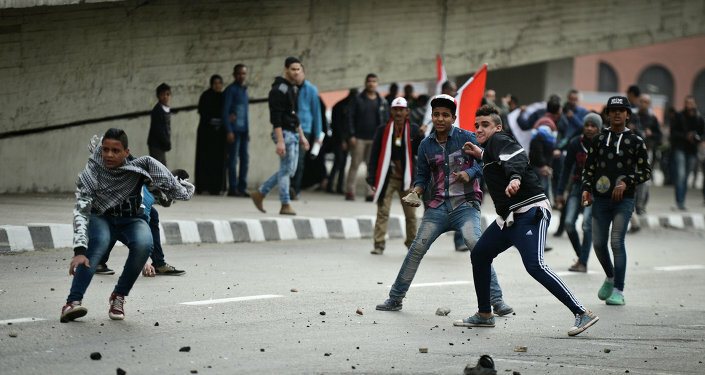 MOSCOW, February 1 (Sputnik) — Elements of the "leadership of the revolutionary youth" of the Muslim Brotherhood in Egypt have issued a statement demanding that foreigners leave the country before February 11, threatening violence if their demands are not met. An anchor on the Brotherhood-associated television channel Rabia, transmitting from Turkey, aired the statement on Saturday, citing unnamed elements of the "leadership of the revolutionary youth." According to the statement, foreigners, as well as companies, embassies and consulates must also end their activities in the country, threatening physical violence if their demands are not met. On Saturday evening, Rabia's Facebook page released a statement noting that it "opposes violence," and that "the sensational statement was only supposed to be a topic for discussion in the studio." The representatives of the channels cannot confirm whether the statement has "any basis in reality," according to media reports. This is not the first threat against foreigners to have been issued by militants in Egypt. Last year, extremists operating in northern Sinai also promised to cause harm to foreign tourists visiting the country.